Dedicated to my handsome, young nephew Beau; this cabin is charming, adorable and full to overflowing with smiles (just like my nephew). The Beau Cabin is decorated with beautiful accents of wildlife. Clean, neat & cozy, this cabin is ideal for a family or small group of friends. 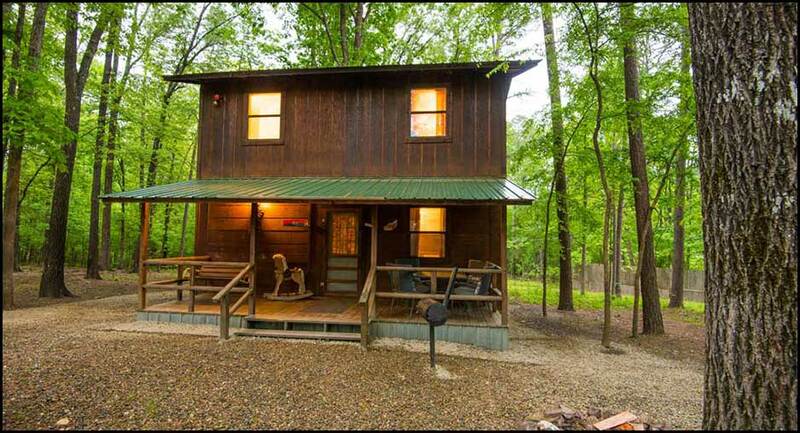 Beau Cabin is a two story cabin with an open kitchen/living area downstairs and a shared bedroom on the second floor. The second floor features a 1/2 bath, shuffleboard table, large king bed and two twin beds. You can also enjoy a relaxing evening in the outdoor hot tub. Located adjacent to the upstairs bedroom – the hot tub deck sits high in the tree line – just a perfect way to end a long day. You’ll enjoy sitting outside on the covered deck while relaxing on the porch swing. The kids will love the family friendly atmosphere with plenty of courtyard area to explore. BRING YOUR BICYCLES! The courtyard area of the Last Resort Campground features a large circle driveway with an incredible rock fire pit area. We provide the firewood and outdoor lighting; you just bring the marshmallows! The Last Resort Cabins are one of the family friendliest & pet friendliest camp grounds in Broken Bow. Bring your family and friends and experience nature where you can bike or hike right out the front door. Eight cabins are set amidst the lushness of the hardwood forest; this relaxing Broken Bow getaway greets you with a casual invitation to come and enjoy! Beau Cabin is a one bedroom, two story cabin. King Bedroom Upstairs - 2 Twin beds(1 twin, 1 trundle)half bath, shuffleboard, and an adjacent balcony overlooking the forest featuring a 4-6 person hot tub. Quaint two-story cabin featuring a covered front porch, porch swing, balcony with a hot tub, shuffleboard table, and a large playground/open courtyard area. The Beau Cabin is located in an area with other cabins, known as Last Resort Campground. It is located on Golf Course Road which is north of the lake (Please click to view map) There are other cabins in this area. Each one offers limited privacy. This cabin is not secluded but there are several trees in this area. The road to the Beau Cabin is black-top, then it changes to gravel. There are only about 75 yards of a gravel road. It is motorcycle friendly.